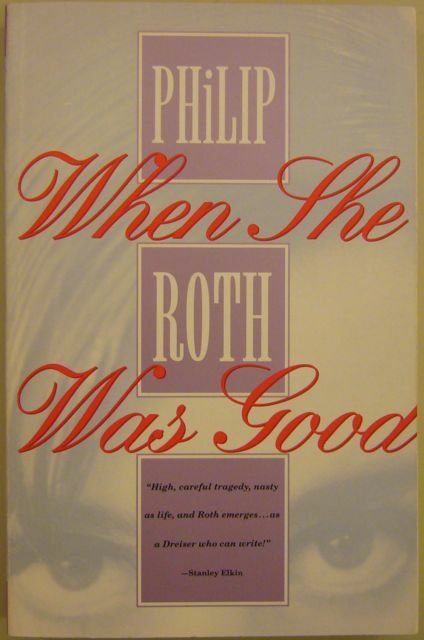 I first read Philip Roth’s second novel, When She Was Good, in March 2000 in this Vintage International paperback edition. 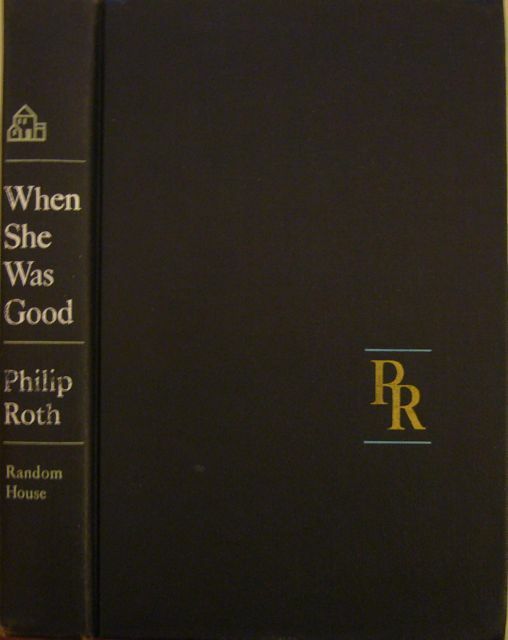 Cover of Philip Roth's When She Was Good in the Vintage International edition (New York: Random House, 1995). It was originally published in 1967 – five years after his first novel, Letting Go (1962). Neither of these books have any of the lightness and humour that can be found in his debut collection, Goodbye, Columbus, and Five Short Stories (1959). Indeed, having won the National Book Award for that collection in 1960, Roth set out to show the world that he was a “serious” writer who would write “serious” novels. When She Was Good is indeed a “serious” novel, overly so. A while ago I came across a 1967 hardback edition of the novel, published by Random House. The dust jacket was missing, but the book was cheap and in good condition. Spine and front cover of a 1967 Random House edition of Philip Roth's When She Was Good (New York: Random House, 1967). Having bought it, I thought I might reread it – why not, after an 11-year gap? But after reading the opening sentence again – “Not to be rich, not to be famous, not to be mighty, not even to be happy, but to be civilized – that was the dream of his life” – I decided I might wait a while longer. What caught my eye, however, was the short biographical notice at the end of the book, which informs us that Roth was “born in Newark, New Jersey, in 1933”, that he was “educated at Bucknell University and the University of Chicago”, that “Goodby, Columbus” (sic) “received the National Book Award for Fiction in 1960”, that “Mr Roth’s stories have appeared in The New Yorker, Commentary, Harper’s and Paris Review, among other periodicals, and have been reprinted in Martha Foley’s Best American Short Stories anthology”, and, lastly, that “His story ‘Defender of the Faith’ won second prize in the O. Henry Prize Story Contest of 1960”. 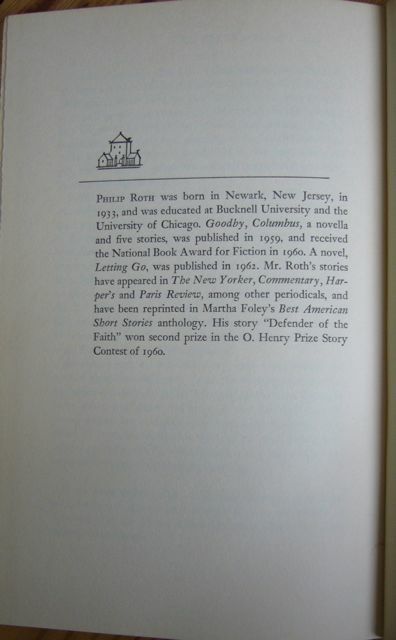 Biographical notice in the 1967 Random House edition of Roth's When She Was Good. And what struck me was that this was, of course, Roth before the landmark Portnoy’s Complaint, which would only appear two years later, in 1969, and this is to say that this was Roth before he became “Philip Roth”, the Philip Roth whose career would largely be defined by Portnoy and his readers’ response to it (and his response to his readers). And it struck me because I tried to imagine what it must have been like to read Roth “in real time”, as it were, to read him as his books came out (I only started reading his work in late 1997, when I read Patrimony, which was released in 1991). What would it have been like to read this edition fresh off the press? Would I even have bought it? Maybe not. Maybe if I had read Letting Go I would have glimpsed at the opening sentence and thought that I might wait for his next book. This entry was posted in Philip Roth and tagged Philip Roth, When She Was Good. Bookmark the permalink.